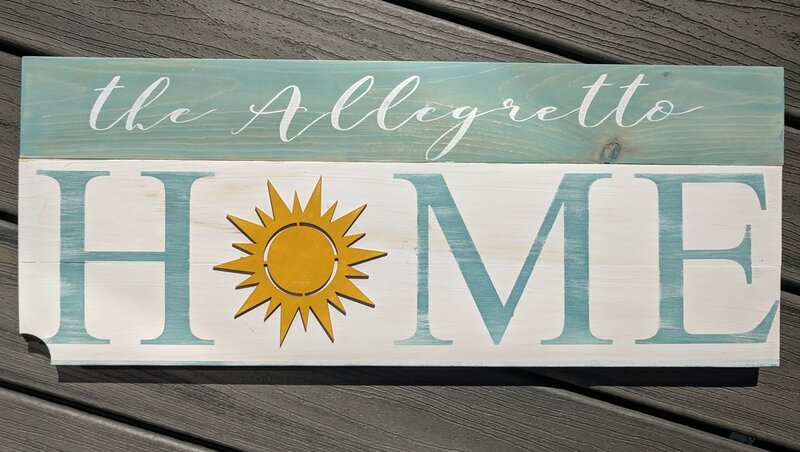 On Tuesday May 21st, we’re having out first Craft Workshop at Galway Rock Vineyard & Winery, where we’ll be crafting some beautiful spring projects, including the SUPER popular Interchangeable HOME Signs! All the supplies you need will be provided. Just bring yourself and wear clothing you wouldn't mind getting a little paint on. The size of your plank sign will depend on the design you choose , please scroll down for details and design choices. At the workshop, we will teach you various different techniques for painting your wood sign. There will be about 30 paint colors you can choose from to really make your sign fit your home and family. You also have the option to FRAME your sign! Framing adds a lovely finish to your project. And did we mention… your first drink is on US! This plank sign is approximately 7” x 25” and comes with the ability to change out the shape of the “O” to fit your decor all year round! You can choose to have 4 shapes ($65) or 8 shapes ($70). Please choose Shape Group 1 or Group 2.